Day three of our trip began around 6am, in Four Mile Creek State Park, outside of Niagara Falls, New York. For breakfast we cooked up hot tea and scrambled eggs with cheddar in a small frying pan on our campfire. Are we camping pros or what? Then it was time to pack up camp and head to Niagara Falls, before it was swarmed with crowds. 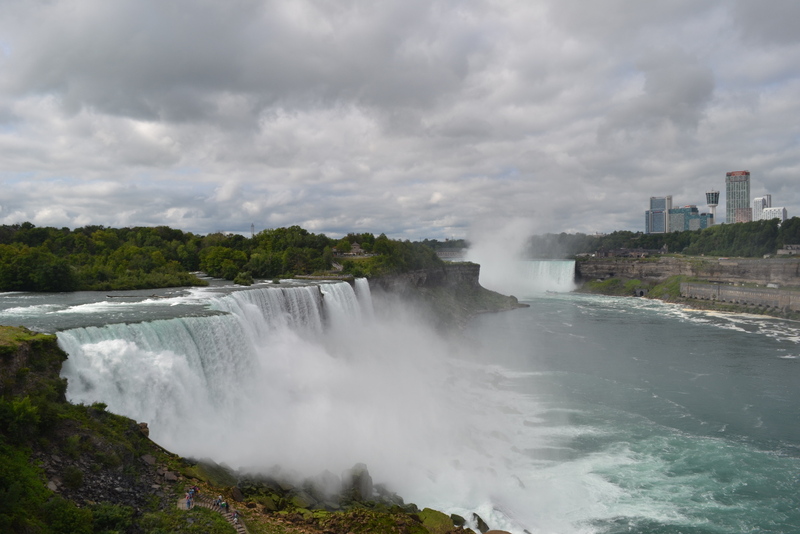 I had never been to Niagara Falls before, so I wanted to see the famous site and take the Maid of the Mist boat tour, which gets passengers as close as possible to the falls. 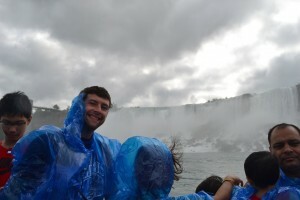 Having now done it, here’s my assessment: The boat tour offers a unique way to see the falls and is probably worth doing to say you’ve done it, but it’s definitely a tourist trap. It costs $18.25 to pile onto a boat filled with tourists, cruise on out to the falls, twirl around and cruise on back. The entire process probably takes 30 minutes, tops. That said, the falls are definitely impressive – a reminder of the power of nature! Certainly worth seeing in some capacity (I hear the Canadian side offers better views – bring your passport), but the boat trip is your call. Although the mist coming off the falls does feel good on a hot summer day. If you do decide to go, go early! My husband and I got there a few minutes after 9am, which is when the first boat leaves. We were on the 9:30am, and when we got back and were heading out, the line had already grown immensely. We both loathe big crowds, so we were glad to be leaving and not stuck in the long line. There’s just a bit of mist coming off the falls! From there, it was on to our next stop, Cuyahoga Valley National Park in Ohio. We tried to stay on Route 20 as much as possible, still hoping to avoid I-90. We passed through some lovely farmland and wine country in southwestern New York, which made for some pretty viewing. Lunch was a picnic in Erie, PA, which from the looks of it is not the nicest of towns. We didn’t stay long, however, so I can’t provide a true and fair assessment. On to Ohio! Shortly after crossing the border we headed for Lake Road, which promised better views of Lake Erie. We also stopped at a park along the way to dip our feet in the water, which was a very pleasant temperature. Made me wish I had a bathing suit handy! Alas, no time for that as it was already mid-afternoon and we had a ways to go before getting to our campground in Cuyahoga Valley National Park. We arrived around 6pm and headed to Stanford House to check in. Cuyahoga Valley offers five primitive campsites, available by reservation only. The sites themselves are basic but nice. Each area has a picnic table and room to pitch a tent and is surrounded by trees and tall brush to provide some privacy. There are no fire pits at the sites – you must cook your food at a communal fire pit close to the entrance of the campground. Additionally, the sites are “hike in,” although “hike” is used loosely. They’re a walk from the parking lot, though, so you do have to have your things organized and in an easily movable state. Additionally, you can’t leave your car parked overnight. You have to unload what you need and move the car to the closest visitor center, which is probably a little over a half mile away. So, in short: nice sites, but not easy “back up the car and open the trunk camping.” It takes more planning and more carrying of things from place to place. Additionally, be aware of raccoons! The ladies at Stanford House warned us to either hang our food on the hooks provided at each campsite or stow our coolers securely under the picnic table. Well, I recommend the former. Not long after we’d gotten into our tent we heard the rustle of mischievous raccoons trying to get at the cooler, and our flashlight revealed their beady eyes reflecting in the dark. We quickly adjusted our plan and hung the cooler, but the raccoons remained in the area. One jumped up on the picnic table and several climbed a nearby tree and continued rustling in the bushes. By the end of our encounter, we had lost a water bottle, a spatula, some grapes and (we think) some hamburger buns to the crafty animals. The hamburger buns are the true mystery – we’re not sure how they were stolen, and in fact we were convinced we had them until lunch the next day, at which point they were nowhere to be found. Somewhere in the Cuyahoga Valley, I image a family of victorious raccoons are hosting a barbecue. Lesson learned: On day two of camping, we ate earlier and moved all our food related items back into the car before retiring for the night. Steal our grapes one, shame on you. Steal our grapes twice, shame on us.